Antique Guatemalan dance masks and unique folk art from Mexico, Guatemala, Brazil, and other Latin American countries. Antique Brazilian ex-votos and authentic candomblé metal art. Sacred art, santos, nichos and retablos from the Americas. 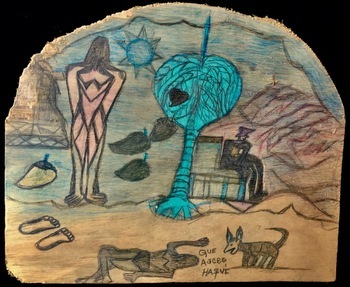 Outsider art and works by self-taught artists from North and South America. Contemporary art by artists living and working in Cuba today (Juan Roberto Diago Durruthy, Joel Jover Llenderosas, Luis Alberto Copperi, José Garcia Montebravo, and others). Ethnographic art from Borneo, China, Vietnam and around the world. Collected, curated and sold by Beate Echols. Please read our blog posts on this website!